Vast Vision – Exclusive mix for bejbi.se. The 22:th of our series of exclusive mixes..
Click ”see the rest of this entry” to read more about Vast Vision and download the mix. 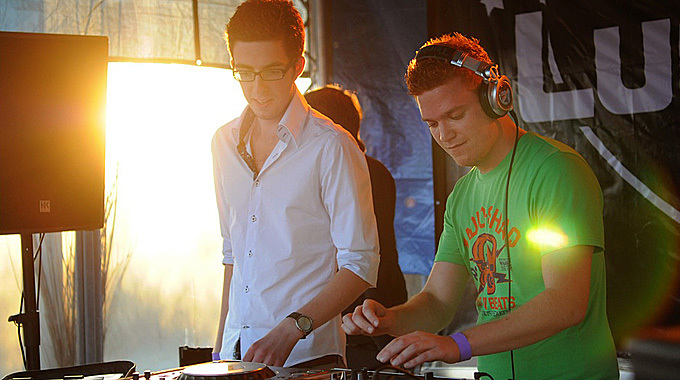 Vast Vision has proven to be one of the Dutch most talented trance DJ and producer duo’s at this moment. With tracks like ”Aurora,” ”Ellipse,” and ”Euphoria,” Vast Vision gained recognition from the big names all around the world, and with every track is another rise of success. Their hit, ”Summer Blush,” was voted tune of the week by Armin Van Buuren and is being caned on his radio show, ”A State of Trance.” In fact, Armin loves the tune so much, that he decided to sign their alias Vast Vision Presents Mungo to Armada. After “Summerblush”, one after the other track was a succes. With remixes for Fast Distance, Abbott & Chambers, Andrelli & Blue, Misja Helsloot, Lens Flare, Sequentia and Peter Martijn Wijna they are really getting noticed. Stijn Coppieters (1986), the producing half of the Dutch duo Vast Vision, has always had a love for music. During his younger years, he listened to a considerable amount of music, but mostly to what his father enjoyed. Bands like Pink Floyd and Genesis were the influences he grew up with. Stijn realized his first real interest for music during his music classes between the ages of 9 and 12. He displayed great talent for rhythm and musical composition. His music career began in September 2003, when he got his hands on his first music software. Around that time, he also became friends with Roland Andriese (1985), the DJ-ing half of Vast Vision, who taught him the basics of digital music production. Like Stijn, Roland also grew up with music. His father and grandfather both played the piano and he was dying to do the same. From a young age, he became interested in electronic music such as Daft Punk. Roland was forced to choose between computers and music because his interests proved to be too wide spread. He chose computers, but could not deny his passion for music. After joining a team that was working on a modification for a game, he met Stijn and they decided to produce music together. After some months of getting used to the software, they decided to name their project Vast Vision. What they didn’t know was that their productions would grow to be an essential part of the trance scene. Before they knew it, Vast Vision became an established name. Being signed to Armada has really gave a boost to their carreer. With additional big releases and remixes on Armada, Alter Ego Records, Offshore Music and more, being caned by all the big jocks (including, Armin van Buuren, Tiesto, Ferry Corsten, Above & Beyond Aly & Fila) throughout 2008 and 2009, they have proven to be one of the big upcoming talents. 2009 and 2010 was untill now a great years for Vast Vision with remixes and releases like “Ocean Blue”, and their biggest hit so far “Everything” and their new single ”Behind your smile” just released with a massive response. They are a name in the scene you can’t miss. Now they are the 22:th out for a series of exclusive mixes recorded for bejbi.se by our favorite dj´s, both well known, and unknown, that we will publish once a week untill we run dry. Download Vast Vision´s Exclusive mix here (right click and save as) or listen to it live on Soundcloud or just press play below here. If you want more of Vast Vision, check out their homepage Vast-Vision.com or their myspace, myspace.com/vastvisionmusic for more info.